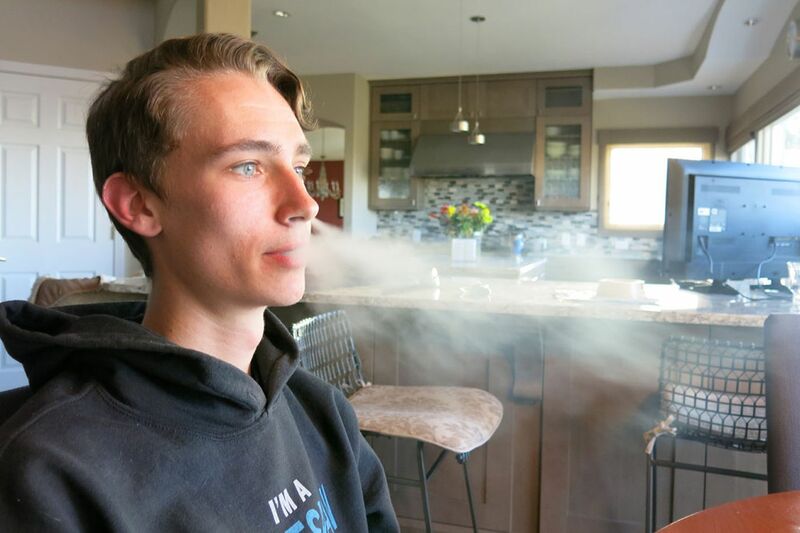 Julien Lavandier, a Colorado State University student, started smoking e-cigarettes as a high school sophomore. He says he's now hooked on Juul and has been unable to quit. Adolescents who smoke cigarettes or e-cigarettes are more likely to use marijuana than peers who shun the nicotine products, suggests a study from the American Academy of Pediatrics. Cigarette use has already been linked to marijuana use. However, this study associated the use of other devices, such as hookah and e-cigarettes, to marijuana use as well. Young people are becoming less likely to smoke cigarettes but they are increasingly using e-cigarettes and hookah. Nationwide regulations restrict the sale and advertising of cigarettes, but with hookah and e-cigarettes, regulations have not kept pace, experts say. >> READ MORE: Youth smoking trends in Philadelphia are changing. Now the city's lost a major tool to stop that. "Some of the access is not as limited as maybe we need it to be," said Janet Audrain-McGovern, co-author of the study and a psychology professor at the University of Pennsylvania. "That may give adolescents the notion that it's acceptable." Adolescents who had used e-cigarettes at some point were 2.5 times more likely to start using marijuana within two years than those who never used e-cigarettes. They were also more than twice as likely to be current users of marijuana two years later. For traditional cigarettes, one of every two young users started on marijuana within two years. Audrain-McGovern smoked cigarettes as an adolescent when "we knew tobacco was bad for you, but there wasn't that societal pressure not to smoke," she said. "Society has changed surrounding cigarette use, but it hasn't yet changed for the new products." E-cigarettes, such as Juuls, are considered dangerous for adolescents because they deliver nicotine in a flavored liquid that still is addictive — though not combustible like traditional cigarettes — and thought to have a particular impact on a developing brain. "Because they don't share the same harms doesn't mean that they don't have their own unique harms," Audrain-McGovern said. The growing legalization of marijuana for recreational and medical use might also give young people the idea that the risks of marijuana are lesser, said Audrain-McGovern. The longitudinal study, conducted via classroom surveys in 10 public schools in Los Angeles, used a baseline test given to ninth graders and a follow-up given to the same students, two years later. "Now is a time where we are seeing less cigarette use and more use of these other products," Audrain-McGovern said. "We just have to get a handle on why adolescents are using them and how we can prevent their use."